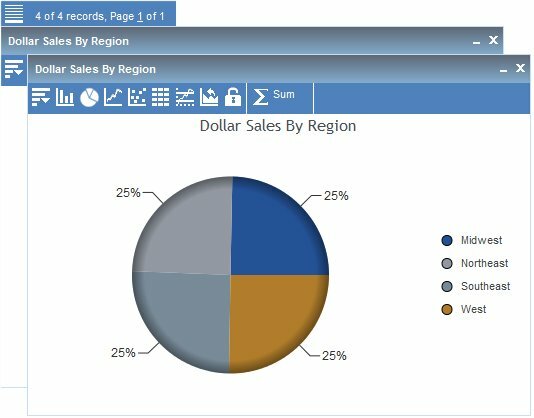 You can view data in your active report as a line, bar, scatter, or pie chart. For example, the following image shows an HTML active report. The following image shows a chart that was rendered from the data in the report. This is a pie chart that shows the sum of the values in the Quantity field by Plant. Once a chart is rendered, you can use the chart icons as follows. Create new charts to compare values, especially when using the Freeze options. Change or add fields. You can only add fields to a bar or line chart. Export charts to another application or open the Chart/Rollup Tool. Change the chart type to a bar chart. Change the chart type to a pie chart. Change the chart type to a line chart. Change the chart type to a scatter chart. 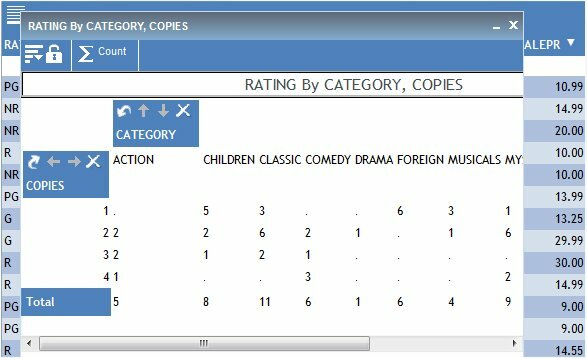 Scatter charts are available for numeric columns. View the chart as a report in table format. 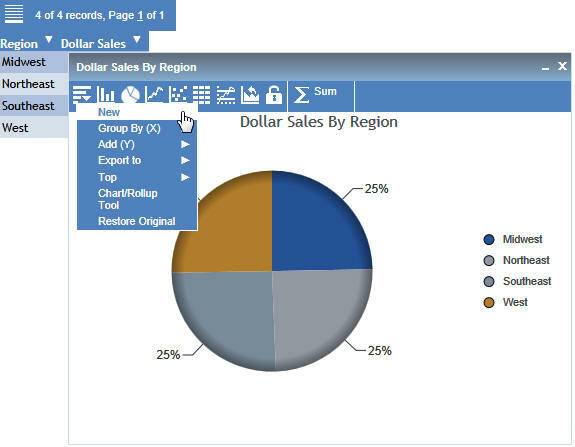 Return to the Series tab in the Chart/Rollup Tool. Restores the current chart type to the initial chart type that was displayed. Freeze chart. You can link or unlink a chart to the filters you have applied in your report using the Freeze chart icon. The icon indicates whether the report is linked to the filter (Freeze chart) or not (UnFreeze chart). Note: If your startup presentation is an active chart instead of a tabular active report, then the Rollup and Freeze icons are not available. For example, on the Format tab in the Report Options dialog box in Report Painter, if the Initial Presentation is set to Bar Chart instead of Grid, then you will not see the Rollup and Freeze icons on the bar chart toolbar. Click the arrow in the heading of the column you want to chart and select Chart. Select the chart type (Pie, Line, Bar, Scatter) from the menu. The menu that appears shows you how the chart is going to be created. The first row tells you the calculation, for example Group By (SUM), then the following rows list the vertical (By) sort fields in the report that you can select for the X-axis. The column title you clicked is the field that displays on the Y-axis. The chart is rendered. 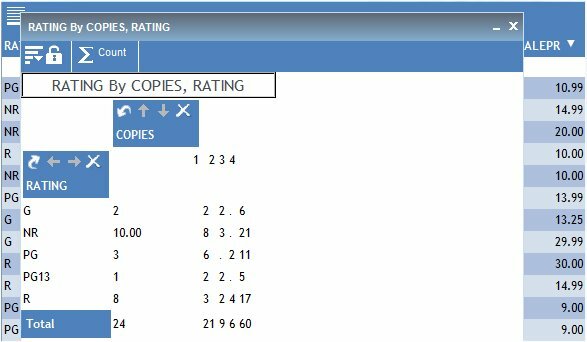 You can create a new chart from the chart window, create a Rollup Table, change the type of calculation for the column, and view data tips for the chart items. Tip: To view data tips in a chart, point to the pie slice (or column, or dot, depending on your chart type), to view the data tip for the field. For example, the following image shows a data tip for a column in a bar chart. If you click on a column, the data tip includes the column data and name, as shown in the following image. 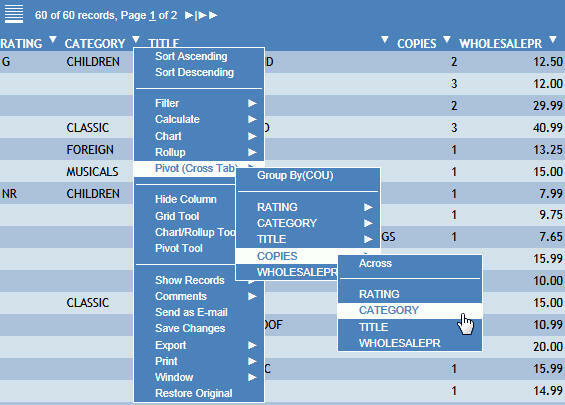 From a chart window in the active report output, select New from the chart menu icon. Another chart window opens with the same chart. Select the Freeze icon to unlink the chart to the filters you applied in your report. Any additional filters that you apply do not affect this chart window. Select the Freeze icon again to unfreeze the chart and link the chart to the report when new filters are applied. Change the type of calculation for data in the column. You can select Sum, Avg, Min, Max, Count, or Distinct as the aggregation method (calculation type) for numeric data. You can select Count or Distinct as the aggregation method (calculation type) for non-numeric data. For more information about the available types of calculation in active reports, see Calculating Data. To return to the original view of the active chart, select Restore Original from the chart menu icon in the chart window. The following apply to charts. In some cases, the behavior is the result of the Active Technologies chart engine that you are using. The ARGRAPHENGINE setting specifies the chart engine used for rendering charts in Active Technologies. For more information on the ARGRAPHENGINE syntax and settings for the chart engine, see Switching the Chart Engine. Active HTML5 charts that are separated based on the value of an ACROSS field are supported only when you use the WebFOCUS HTML5 chart engine (ARGRAPHENGINE = JSCHART). Unnecessary calculation options for an alpha format field in an active chart are displayed when the output format is AHTML. The following applies when you use the WebFOCUS HTML5 chart engine (ARGRAPHENGINE=JSCHART). When a pie chart has four or more slices with a value of zero (0), the stack of 0% labels may be cut off or overlaid. When you use the Flash chart engine (ARGRAPHENGINE=FUSION) with the FLEX output format, the rightmost X-axis label on a horizontal bar chart is cut off. Use the WebFOCUS HTML5 chart engine (ARGRAPHENGINE=JSCHART) instead. When you use the Active Technologies legacy chart engine (ARGRAPHENGINE=DEFAULT), the X-axis labels on a scatter chart overlap. Use the WebFOCUS HTML5 chart engine (ARGRAPHENGINE=JSCHART) instead. X-axis labels overlap and are cut off when you reduce the size of a chart. If there are multiple Y-axis fields for a pie chart, the chart uses the first field selected to draw the chart. If adding multiple Y-axis fields to draw the pie chart from the chart window, the chart uses the first Y-axis field selected to draw the pie chart. Scatter charts can represent only detailed data (numeric) without any aggregation method applied. When you create a pie chart using the HTML active report output format (AHTML), the values are sorted alphabetically in the pie slices clockwise, from left to right. When you create a pie chart using the active report for Adobe Flash Player (FLEX) and active report for PDF (APDF) output formats, the values are sorted alphabetically in the pie slices counter-clockwise, from right to left. The labels on a pie chart, in an active dashboard, may overlap if there is an excessive number of slices in the pie. You can view data in an active report in a Rollup Table. 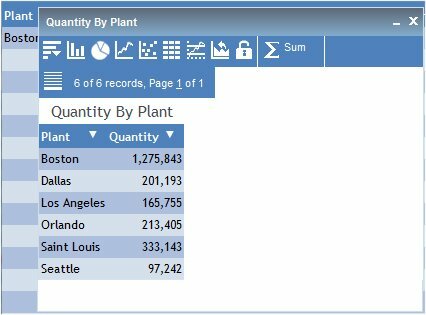 For example, consider an active report that has the Order Number, Date of Order, Line Total, and Quantity sorted by Plant and by Product. If you need to see only the quantity in stock for each plant, you can create a Rollup Table with only those fields, as shown in the following image. Click the arrow in the heading of the column you want to create a Rollup Table for and select Rollup. Select the sort field from the submenu. The Rollup Table opens in a separate window. Pivot Tables reorganize and summarize selected fields of data in order to obtain a specific report. A Pivot Table pivots, or turns, the data to view it from different perspectives, without actually changing the data from the report. Run the active report, click the arrow in any column heading, and select Pivot (Cross Tab). Select a Group By field, and Across field, respectively, from the Pivot (Cross Tab) submenu. The selected Group By field is the vertical sort field, and the selected Across field is the horizontal sort field in the Pivot Table. The Pivot Table appears in the same web browser session. The Pivot Table inherits the style used in the original active report. You can use the Pivot controls and Pivot Table menu options to select additional values and calculations. The following image is an example of a Pivot Table for an HTML active report. The New icon opens a new window with the same Pivot Table. 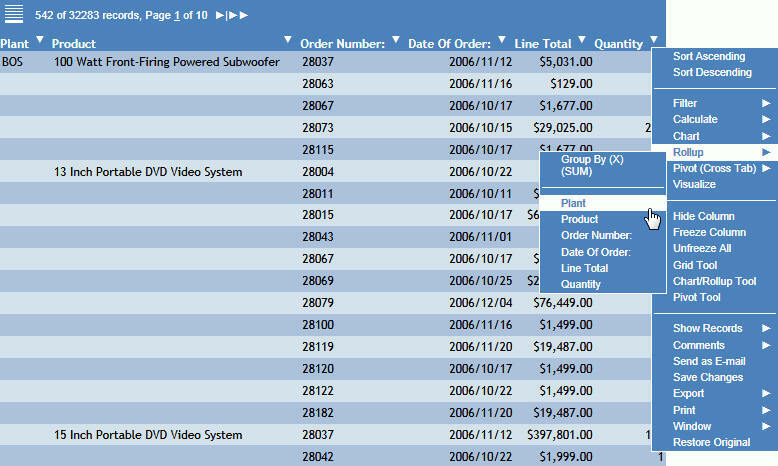 This Pivot Table window can be used to compare values, especially when you use the Freeze option. Add additional vertical sort fields (Add (Y)) and horizontal sort fields (Group By (X)) to the Pivot Table. You can also export the Pivot Table to another application and open the Pivot Tool. Select the Freeze icon to keep the Pivot Table frozen so that additional selection criteria does not reflect in the Pivot Table. Select the Freeze icon again to unfreeze the table and reflect new selection criteria in the Pivot Table. The Calculation icon identifies the calculation value for the Pivot Table. Options are Sum, Avg, Min, Max, Count, and Distinct. Sum is the default calculation value. The Pivot Table has individual controls for each sorting column or row. These controls enable you to alternate the sorting to analyze the data. The following image is an example of the Pivot controls in a Pivot Table. The following controls are available from the Pivot Table. Moves a column sort to a row sort or vice versa. Up and down arrows enable you to switch the order of the sorts and move the column to a new position in the Pivot Table. Arrows are unavailable if there is only one sort column. Left and right arrows enable you to switch the order of the sorts and move the row to a new position in the Pivot Table. Arrows are unavailable if there is only one sort row. Deletes the column or row from the Pivot Table. An accordion report is a report that has expandable views of data for each vertical (By) sort field. Only data values of the first (highest-level) vertical sort field are shown initially for accordion reports. All other data is hidden. You can use an inner sort with accordion reports, where the sort column values are sorted within the parent to which they belong. To sort on all values in the report, you must first expand all data in the report. You can expand your view to expose data values of lower-level sort fields, either manually by clicking the plus signs (+) or if you are viewing an accordion report. Click the arrow in a column heading. From the Accordion menu, select Expand All.